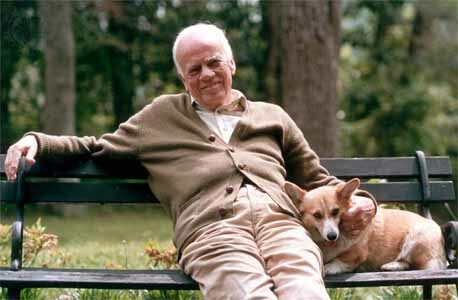 Happy Birthday to Walker Percy! You live in a deranged age, more deranged that usual, because in spite of great scientific and technological advances, man has not the faintest idea of who he is or what he is doing. The search is what anyone would undertake if he were not sunk in the everydayness of his own life. To become aware of the possibility of the search is to be onto something. Not to be onto something is to be in despair. This is the fourth post in a series on The Sickness Unto Death. For other posts in the series, see here. Kierkegaard begins this section by asking (more or less), “Is despair a good thing or a bad thing?” His answer is: both. It is good in that the possibility of despair shows man’s excellence, his superiority over animality, and that he is spirit. That is, only people can despair – animals cannot. It is bad in that despair is the worst possible sate for man to be in, it is “ruination”. Normally things do not relate in this way. Normally the actuality of something is greater than the mere possibility. “To be” is greater that “to be able to be”. Unlike other sickness, to “not be in despair” means that there cannot be the possibility of despair, because of its inverse relation of possibility to actuality. One must constantly destroy the possibility of despair in order to not be in despair. So, despair is the misrelation of the synthesis mentioned in the previous section (of the possible / necessary and of the infinite / finite). It is in the synthesis that lies the possibility for the misrelation. It is not the synthesis itself, otherwise it would be something that happens to man (nature). The responsibility for the synthesis is the self in relating itself to itself. In this sense, man is responsible for his despair. Unlike other sickness, every moment of despair, is traced back to the person, to the possibility. Every moment the individual is bringing it upon himself. The basic idea here is that despair is the condition of misunderstanding (or misrelating) what you are to yourself. That is, of not willing to be what we were created to be, or of willing to be something other than what we were created to be. Feeling dizzy now? Doesn’t make sense? Keep reading! The Sickness Unto Death, Part I.A. This is the third post in a series on The Sickness Unto Death. For other posts in the series, see here. Say what? Some scholars have posited that Kierkegaard is being ironic here, mocking the Hegelian logic fashionable during his time. But we need not be experts in Hegel nor concern ourselves with the possible “irony” here to understand how Kierkegaard understands the human person. The basic idea here is that the “self” is not yet fully formed. That is, we are not yet fully “ourselves”. Jean-Paul Sartre picked up this theme with his mantra, “Existence precedes essence.” For Sartre, the fact that we are not fully defined before our creation (in the way an inventor has an idea of an invention prior to making it, hence, in that case, “essence precedes existence), we must define ourselves. But such a solution is not what Kierkegaard has in mind. While it is true that we are not fully what we are intended to be, it does not follow that this is no “way to be”. That is, that there is no definition of what it means to be human. It is this struggle between willing to be what we want to be instead of what we were created to be that will lead to despair. Kierkegaard, as is quite typical, does not yet define “despair”. He is not an analytic philosopher, setting down the definitions of his terms and then arguing from there. Instead, Kierkegaard will use a word and then circle back to it again and again, getting closer to the definition and involving the reader in the struggle to define it. This has the advantage of pulling the reader in and forcing a participation. Even when you know this is what Kierkegaard is doing, it does not diminish its effectiveness. So, when people come to me confused about a part in Kierkegaard, my advice is always, just keep reading – and then reread and reread – you’ll come to it eventually. What Kierkegaard does offer in this section is an introduction to the tensions persons have within them. A person, says Kierkegaard, is made up of seemingly conflicting parts: (a) the Possible and the Necessary; (b) the Infinite and the Finite. It is in attempting to “live in” one of these extremes more than another that a person will despair. Doesn’t make sense? Keep reading. The main ideas that one needs to come out of this section with is the notion that we are not fully ourselves, that we despair when we try to be something other than what we were created to be, and the solution is in a “resting” in the Creator. This is the second post in a series on The Sickness Unto Death. For other posts in the series, see here. The title of Kierkegaard’s text is taken from John 11:4 and the story of Lazarus. By this story Kierkegaard makes a distinction between physical death and spiritual death. Quite characteristically, Kierkegaard will refer to both as simply “death” and it is up to the reader to distinguish which he means at any given time. This may lead to confusion, but forces the reader to engage and participate in the text. Humanly speaking, death is the end; it is the “sickness unto death.” But for the Christian death “is only a minor event within that which is all, an eternal life” (8). Every earthly suffering one can imagine, the horrors of war, plagues, destruction, are not the “sicknesses unto death.” The Christian, by coming to Christ, has learned both the best of all things and the worst of all things. The best, of course, is eternal life. But in coming to learn of eternal life, the Christian is also made aware of the thing which surpasses all earthly suffering and torment, and that thing is the “sickness unto death.” The non-Christian does not fear the “sickness unto death” because he does not know what it is. By fearing physical death, the non-Christian is like a child who runs or cowers from things that are not really horrifying. It is only the Christian that fears what is truly horrifying, and that is the sickness unto death; Kierkegaard calls the sickness unto death the “most appalling danger that the Christian has learned” (9). Kierkegaard identifies “the sickness unto death” as “despair,” and defining and explaining this “despair” is subject of the book. Stay tuned as we turn next to just what the “sickness unto death” (i.e., despair) is. Get ready folks, a new series is coming! In the coming weeks / months, I’ll be working through Søren Kierkegaard’s The Sickness Unto Death. So, get your copy now! Kierkegaard’s explanation of sin connected with the individual’s struggle to know who they are changed the way I understand both sin and myself. In order to orient ourselves to this particular text (and why you should read it with me), let’s begin by looking briefly at Kierkegaard’s short Preface to the book. There are two basic themes laid out here. First the relationship between what we might call “books of scholarship” and “works of spirituality.” Kierkegaard says that some people might complain that this book is too “scholarly” or “rigorous” given his subtitle: “A Christian Psychologial Exposition for Upbuilding and Awakening.” Here, “upbuilding” is a literal translation of the Danish, “edifying” may also be a close English equivalence. Kierkegaard’s response is simply that this book is not for everybody. The scope and concepts contained in TSUD may go beyond what some people can understand. One must first have the character of “upbuilding” (i.e., Christian). And if you are looking for a Hallmark-esque feel-goodery devotional, you’ll have to look elsewhere. While the content of this book might be difficult, it’s goal is, in fact, “to upbuild” and “to awaken” the reader. Awaken the reader to what? To what is means to be human. Who am I am? What is my purpose? And to analyze these answers with regard to what Kierkegaard considers the quintessential fact of human experience: despair. “Despair” is the sickness of humanity and this text is a diagnoses of that sickness. The cure, while hinted at in this text (i.e., “to die unto the world”) is explored in greater detail in his book, Practice in Christianity. I hope you will join me on this journey through a truly “upbuilding” text.